Walking out on a court that glistens and squeaks as you walk is so inviting. Today the gym is booked all day and everything is perfect. What steps were taken to ensure that all would play safe and pictures would show off the highlights of the events? Preventive maintenance is the key to longevity on any sport floor. Let’s break your maintenance into 3 basic categories: 1. Daily Cleaning 2. Weekly Cleaning 3. Deep Clean and Reseal. It is recommended that access to the gym from an outside entrance be avoided. This reduces the risk of dirt and debris entering and prematurely wearing the sports surface. Also barrier matting at all external doors is a proactive approach to prolonging that mirror like look that is sought after by all. Footwear should be restricted to gum rubber soles or non- marking rubber soles to avoid scuff marks on the floor. Special care should be taken to ensure that surface protectant felt pads are adopted when the gym is used for other activities such as exams, assemblies etc. 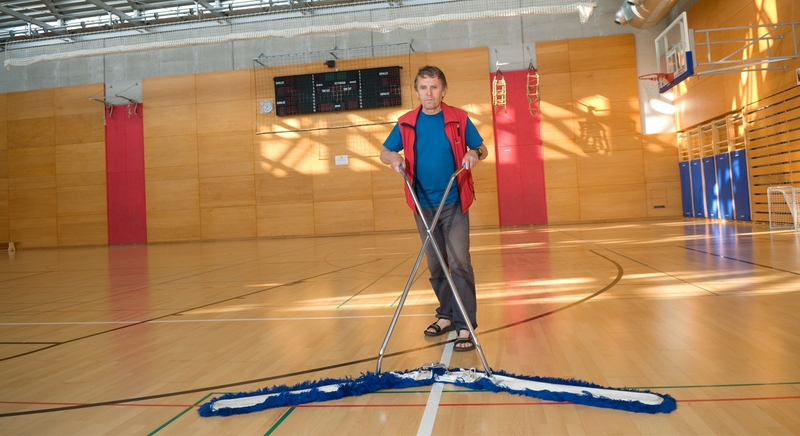 A simple but effective method of controlling the debris that has settled on the surface is to sweep the floor. Collect and remove all surface dust and debris by using a non- treated v mop (synthetic dust mop) prior to any wet cleaning . If wet cleaning is necessary, use a cleaning solution with a neutral PH. This will avoid having a cleaning solution that will soften the surface of the finish diminishing the shine and its ability to resist abrasion. Often Neutral cleaner comes in a concentrate. Please follow the manufactures recommended dilution rate to ensure success. You might find that you can effectively clean your floor by misting the solution on your mop or spray directly on a tough stain and remove the debris with a clean microfiber cloth. If you have access to an auto scrubber or swing arm, mechanical cleaning will enable you to keep ahead of the tough to remove stains. To complete your maintenance program it is important to adopt a schedule to Scrub and Reseal your sport floors as you see fit. This routine will allow you to extend the lifetime of your flooring ensuring that every time you walk out on your sports floor you get that same feeling of pride and satisfaction as you see your floor glisten and hear the squeak of your shoes. For a Complete Care System you may consult the sport section of Finitec Expert’s website.